"Angry Birds", the most downloaded mobile app of 2011, was catapulted to the world of Facebook on Tuesday in a bid by its Finnish maker Rovio to get one billion people playing the addictive game. 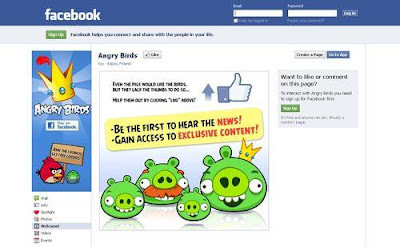 Fans were able to test the new Angry Birds Facebook app online Tuesday morning ahead of its official global launch in Jakarta, the world's most Facebook-connected city. "With the great success of the Angry Birds game on smartphone platforms, Rovio intends to reach more fans and be on every screen and every platform," Rovio Asia senior vice-president Henri Holm said in a statement. "Therefore, the company developed Angry Birds on Facebook to reach more than 800 million Facebook users worldwide." In the game, players fling colourful and grumpy wingless birds from a slingshot into smarmy egg-stealing pigs. It has been downloaded more than 700 million times since it launched in 2009 and the birds have become a global phenomenon, featuring on a huge array of merchandise and in popular culture. The number of players is likely to soar beyond one billion as Rovio offers a new version of the game with more levels and interactive features to around 845 million Facebook users. The new app allows players to compete with their Facebook friends for high scores, send gifts to friends and achieve more precise and powerful targeting by purchasing new "power-ups". Rovio does not disclose how many Angry Birds apps have been downloaded in Indonesia. But the country's love for the game is obvious in the ubiquitous paraphernalia in malls, from Angry Birds mobile phone covers to baby jumpsuits. More than 17 per cent of Indonesia's 240 million people are on Facebook, and Jakarta alone has over 17 million Facebook accounts, according to Holm. "That is more than four times the accounts in New York and almost twice the amount of the second city on the list," the Rovio official told AFP. Second to Jakarta is Istanbul with 9.6 million Facebook accounts, and third is Mexico City with 9.3 million, according to social networking trackers Socialbakers.com. Indonesia as a whole has 43.1 million Facebook accounts, making it Facebook's third-biggest user base after the United States with 155.7 million and India, which just surpasses Indonesia with 43.5 million users. Rovio was a little-known company before its Angry Birds took flight. It had previously launched 50 games with successes including mobile versions of "Burnout" and "Need For Speed".